The Rundown: Screeching Weasel, while having a cool name, is a band that has endured their fair share of turmoil since their inception way back in 1986. Originally from Chicago, Illinois, Screeching Weasel has been on-again/off-again as much as Ross and Rachel from Friends, with comparable drama to boot. The great thing about all the afore mentioned? It doesn’t matter and I don’t care. What I do care about is the awesome music this band has made as well as their consistency. 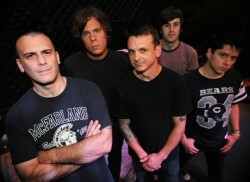 Screeching Weasel is your typical Punk band. They are loud and obnoxious. They make abrasive music sugar-coated with good riffs and melodies. MarsBands.com suggests you check them out to see how Punk music should be done.